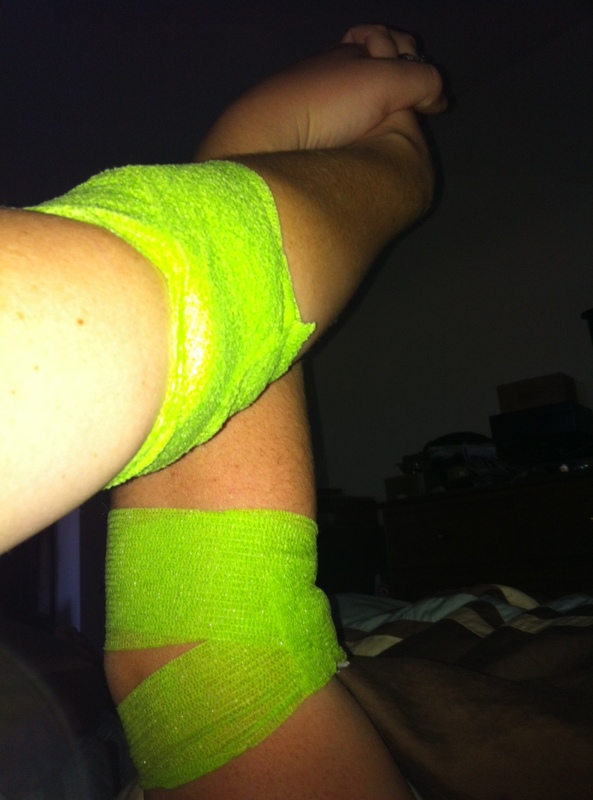 we both got neon green bandages without knowing the other one was getting the same color. we are just that intune with each other and awesome. Joe and I donated blood for the first time today. Our church, Crossline, brought onto LifeStream donation busses on campus and for every person that donated, $20 went to our Haiti Missions Ministry. Now, my whole life I’ve been squeamish about donating blood. Its not the blood that bothers me, or the needles. Its the veins. Veins freak me out. Remember my phobia of tree roots? Its the same thing. Spidery, veiny rooty things really really freak me out. But, Joe and I love the fact that our church has an ongoing relationships with ministries in Haiti and we try to do what we can to support that ministry. Since we didn’t have $40 to contribute, but we did have 2 pints of blood, it was off to the donation bus. The experience was not nearly as bad as I imagined it. It was a very long process (which was partially our fault because we didn’t make an appointment) but the actual act of giving blood wasn’t bad at all. One of my biggest fears was that it would be hard for them to find a vein and that they would have to poke me multiple times. But, the tech/nurse found the vein immidiately and only had to poke me once. Myother fear had to do with the blood pressure cuff. I once had to take 3 hour polygraph test and the blood pressure cuff was so tight it turned my arm purple and I almost failed the test because I was freaking out over my purple arm, to which the test administrator said “I’ve been giving this test for 40 years and no one’s arm has fallen off yet so stop whining.” Ever since then I’ve been a little hesitant about situations that require prolonged contact with a blood pressure cuff. However, the cuff was only tight for a minute while she inserted the needle and then it was fine. Possible crisis averted. Yet another fear of mine (are you starting to realize why I had never done this before?) was that there would be nothing to distract me and I would just be sitting there for ten minutes thinking about veins and would end up crying or literally pulling all my hair out. But, the staff was super friendly and talkative. I asked where the blood went and they told me that it went to hospitals in Southern California and Arizona. I really liked the fact that the blood would stay local. I mean, it doesn’t really matter where it goes because its going to help someone no matter what, but I’m big on people helping local communities and it was nice to know that my blood was going to help people in my general vicinity. I also asked how long the blood could last, which led the tech/nurse to give me a bunch of interesting facts about blood and donations. Whole blood can last about 40 days, however there is such a shortage of blood donations that blood is always used before that 40 day mark. Overall there is only about a 3 day supply of blood in America. If a national disaster happens, we’re screwed. Only 10% of the population considers donating blood, and then only 5% actually donate. But, if we could raise that by just 1% we would have enough blood to go around in case of a disaster. Most people that donate blood have either received blood, have known someone who received blood, or they were taught about the importance of donating blood by their parents. If you have kids, seriously consider teaching them about the importance of blood donation. Alot of blood banks get great participation from high schoolers. For one thing, high schoolers love any excuse to miss class. Plus, peer pressure can work for the good, and in this case a lot of kids who are nervous give into peer pressure and do it anyways. By the time she was done telling me all these fun facts, the bag was full and I was ready to go. I got some sweet neon green tape, ate a delicious cookie and juice, and was good to go! Hubs, on the other hand, had a slightly different experience. Before going in he was talking a big game, claiming he could donate twice as much as me because he was twice as big. And I encouraged him, telling him he could totally double fist it. Well the poor guy almost passed out. He sat up and immediately had to lie back down again. Then the nurses kept him a litte longer than normal (normal is 15 min) because he was so pale! Seriously, he looked sick. And while he was able to walk to the car, he definitely wasn’t able to drive it. But we got some lunch at Bruxie, then went home and watched a movie, and after that he was fine. The nurses told him that next time he needed to drink more water before hand and that would probably help. Who would have thought that blood donation would be the thing to bring down my big strong husband?